Need to hire a forklift ... FAST? 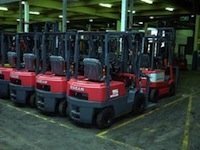 We can provide forklifts and specialist forklift trucks with flexible hire periods for short-term hire by the day, weekly, monthly or long term-term hire. 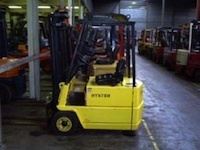 We can provide a forklift hire with our own driver, if required, for those unexpected or specialised one-off jobs. Do you need a forklift quickly? Have you got an unexpected job? Is your own forklift out of action? Do you also need a forklift driver? when you need it, to get you out of trouble! Customers are delighted with our "Instant Forklift" Hire Service. You may be surprised just how often companies find themselves stuck without a truck! Instant payment by WorldPay with Visa and Mastercard, etc. Instant hire is a demanding service for a forklift hire company to provide as it requires quick decisions and a flexible and helpful team. Our instant service helps our customers when they need it most and works well because of the finely-tuned close cooperation of the Bluewater operations team with lots of experience in handling the most extraordinary range of loads and circumstances (see our customer list). 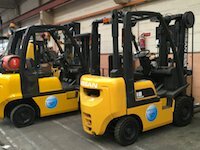 In addition to our instant hire service, we offer the standard short-term and long-term hire of our forklifts for weekly, monthly and yearly periods. We have earned a good reputation for reliability and good quality of service and support as our comprehensive list of satisfied customers will show. "'Hiya Rose and David I just wanted to send you a quick email and say a massive “Thank you” for helping us with our event on Monday. The 2 forklift operators you sent were absolutely lovely to work with and did a sterling job of helping us get our enormous ice sculpture set up without any problems at all. It was a very delicate job and they handled it with skill and care. Brilliant service. Thanks again." It is very important that there is somewhere to park the lorry (ie particularly in London) where access can be a problem, red routes etc. We can get round it by providing a second driver, ie one to take the lorry away while the forklift driver does the job. Is a four wheel forklift more stable and safer than a three wheel forklift? They are both the same as they both behave in terms of stability based on the Stability triangle.